Finalist for the 2018 New Mexico-Arizona Book Awards! 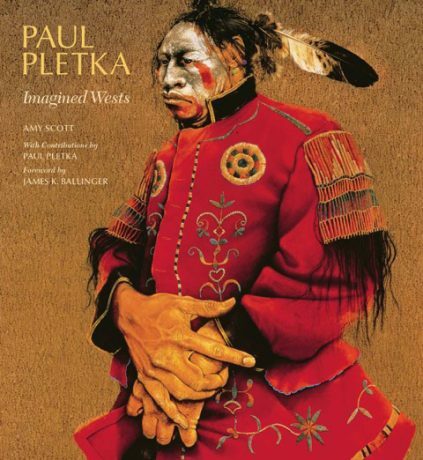 In Paul Pletka: Imagined Wests, the first book on this major American artist in over thirty years, readers will encounter the full range of Pletka’s work through more than eighty color reproductions of his best-known and most influential works. Images of warriors and shamans are paired with depictions of George Armstrong Custer, Christian saints, and the lost gods of North and South America, their forms rendered in a distinctive style that mixes classical drawing and expressionist distortion with elements of Surrealism and European Symbolism. An artist statement and notes on selected works provide rare insight into Pletka’s creative process, and an introductory essay by art historian Amy Scott discusses how Pletka’s studies of indigenous cultures of the American West and Mexico, as well as art historical and critical influences, have informed his work. Complex, mysterious, and mesmerizing, Pletka’s paintings are designed to make it almost impossible to look away. From their boldly conceived subject matter, vivid color, and ethnographic detail, these works—and their creator—are true originals in the rich artistic landscape of the American West. Amy Scott is Chief Curator and Marilyn B. and Calvin B. Gross Curator of Visual Arts at the Autry Museum of the American West in Los Angeles, California. She is the author of The Taos Society of Artists: Masters and Masterworks, The New Mexico Painters, and Len Chmiel: An Authentic Nature. James K. Ballinger is Director Emeritus of the Phoenix Art Museum and author of Frederic Remington.